Some clouds this evening will give way to mainly clear skies overnight. Low 58F. Winds light and variable.. Some clouds this evening will give way to mainly clear skies overnight. Low 58F. Winds light and variable. Highland Park — “Spectator Sport,” an exhibition of terra cotta tableaux by artist Steve Rogers depicting 1980s boxing matches in downtown LA, is closing this weekend at AWHRHWAR Gallery. Rogers created the works on display during the 1980s. The boxing tableaux are based on extensive photographs Rogers took at the Grand Olympic Auditorium in Downtown Los Angeles, which was across from his studio at the time. His focus extends beyond the fighters to the boisterous crowd. Rogers even depicts himself wielding a camera off to the side. The second group of works shows U.S. soldiers acting as tourists in Central America. Rogers traveled throughout the region during the 1960s while serving in the US military and later went on to study art at the San Francisco Art Institute under the GI Bill. 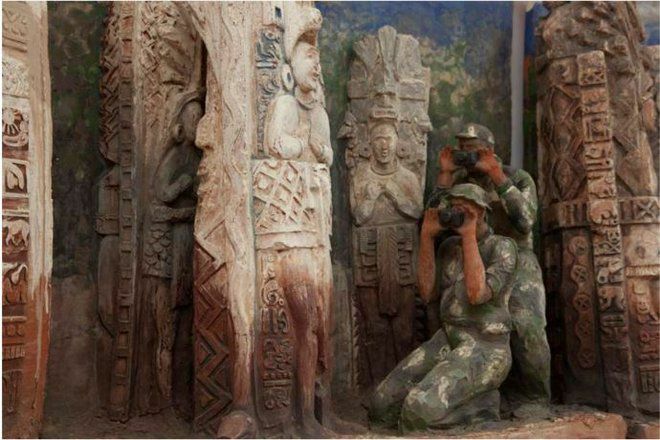 In this detail from “Honduran Holiday,” American soldiers photograph Mayan portrait monuments in Copán, Honduras. The juxtaposition of the two groups of work, one where raucous audiences cheer on fighters, the other where foreign soldiers photograph serene ancient monuments, suggests a complicity between spectators and violence. Rogers’s 1998 large-scale ceramic mural “Hanna’s View” adorns the Metropolitan Water District building next to Union Station. “Spectator Sport” runs through Saturday, November 10, 2018. Gallery hours are Thursdays, 8 – 10pm, Saturday 1 – 5pm, and by appointment.